Since 90% of the weddings I’ve ever been to have been on a Saturday, I will never have to worry about cheating on my diet when having a nice slice of cake! 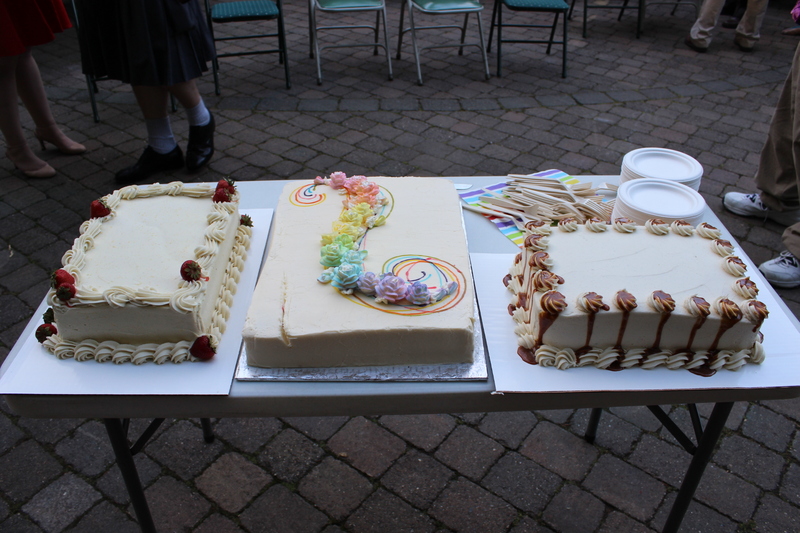 These cakes were from my sister’s wedding last month. Congrats, Tia! As I write this, it is Saturday, my very first cheat day on my diet. I decided to set aside Saturdays for this, since Saturdays are the days I’m most likely to be home and having a good time with my family and most likely to cheat on my diet anyway. For those of you new to my blog, I’m following the diet prescribed in The Four Hour Body by Tim Ferriss. Ferriss recommends a cheat day once a week for two reasons (actually there was a third reason, too, but I can’t remember it off the top of my head). Everybody cheats on their diets at some point. Often, this can lead to guilt and more cheating and then complete abandonment of the diet. If there is no guilt involved because it is regularly scheduled and is something to look forward to, like a little reward, then people are going to stick to their diets better the rest of the time. When I woke up this morning, all excited because I knew today was the day I was going to get to eat whatever I want, the excitement quickly drained away when I realized that I didn’t really want to cheat. I’m feeling really good and I am abounding in energy based on what I have been eating on the diet so far. I don’t really feel like I need to have this cheat day. What if eating this crap and/or extra calories ends up making me start craving the bad for me stuff all over again? I think it was just yesterday that I realized that I’m finally not craving every little bit of goodies that I see. All week every time I went into a truck stop it was a mammoth battle of my willpower vs. the lure of doughnuts. What if this cheat day starts that crave cycle all over again? And what if this cheat day food immediately sticks to my hips, despite what Ferriss says? Obviously Ferriss needs to bone up on his Holly psychology 101, because he didn’t address these fears or how to overcome my inner critic. Whoa. Talk about a blow to my inner child who was really looking forward to eating those strawberry jelly rolls I bought just for the occasion. (I bought them Tuesday—do you know how hard it is for me to not immediately scarf treats? But I didn’t! I waited.) 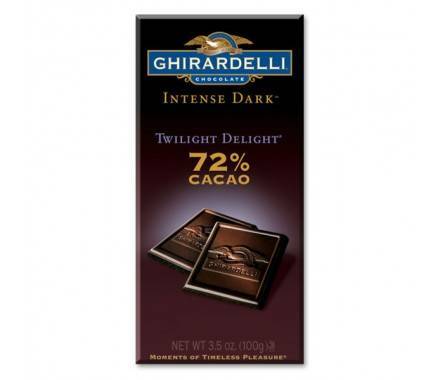 However, I forgot that I had some 72% dark chocolate up there. How can one forget one has dark chocolate? Egads, I need to have my chocolate lover’s card revoked. Ugh. Cheat day is turning out not to be so fun. I need to relax and quit worrying. I suppose the best way to see if this whole cheat day idea is working is to watch the data. I’ll be taking measurements on Monday, one full week after I started my dietary changes. I’ll be watching the numbers over time to get a feel for the patterns my body tends to stick to. I’ll also be logging what I eat every day, including cheat day, so I can get an idea of what I’m eating. I’ll let you know how it all pans out. If the data tells me it isn’t working or if it turns out cheat day leads to cheat week every time, then I know it’s time to cut the concept of cheat day out of my dietary regimen. In the meantime, *gulp* I suppose I’ll have to take one for Team Holly and eat that chocolate. Sigh. If I have to…. It’s a shame I have to eat this chocolate bar all by my lonesome. Wish my family was here with me to share it with. Sigh. UPDATE: I survived my first cheat day. I have to tell you though, it wasn’t pleasant. I ended up with heart burn after eating for lunch some of those tornado thingamajigs that are ubiquitous at gas stations. I also suffered a sugar high after eating those jelly rolls I mentioned. I didn’t overdo it on the chocolate, though. That I savored. One savors chocolate. Three squares of the bar above is a serving. I ate it, carefully re-wrapped the rest and put it aside for next week’s cheat day. I’m looking forward to that! For dinner I had buffalo hot wings, deep fried mushrooms and a Belgian waffle smothered in syrup. I took the leftovers with me and ate the leftover mushrooms later that evening for a snack. Anyway, by the end of the day I felt absolutely disgusting, and I didn’t eat that much different than if I wasn’t watching what I ate. Which was pretty terrible, in retrospect. Man, I eat a lot of crap when I don’t prepare the food myself. When I make my own food, I actually eat really well, even when I’m not on a diet, because I’m conscious of what I’m putting in my mouth. This is a major reason why the scale was creeping up while I’ve been on the truck, obviously. I was eating out far too often. I was also worried that the cheat day would slow down fat loss, but instead, the numbers seem to show differently. As of 7/5, the day before cheat day, I had lost 5.67 inches off my body. Just since that day, I lost an additional 6.58 inches, for a total of 12.25 inches. Whoa. I guess I had nothing to be worried about. (I even measured each one several times just to be sure I wasn’t pulling the tape extra tight so I could get smaller numbers. I was amazed at the differences in just three days!) I also jumped right back into the regular dietary routine the next day, so my fear of going on a cheating bender was unfounded, as well. I think with all the health benefits “they” are finding in chocolate, including a bit of good quality dark chocolate into the daily routine would actually be a good thing — I’m talking an ounce or two tops. IMO.